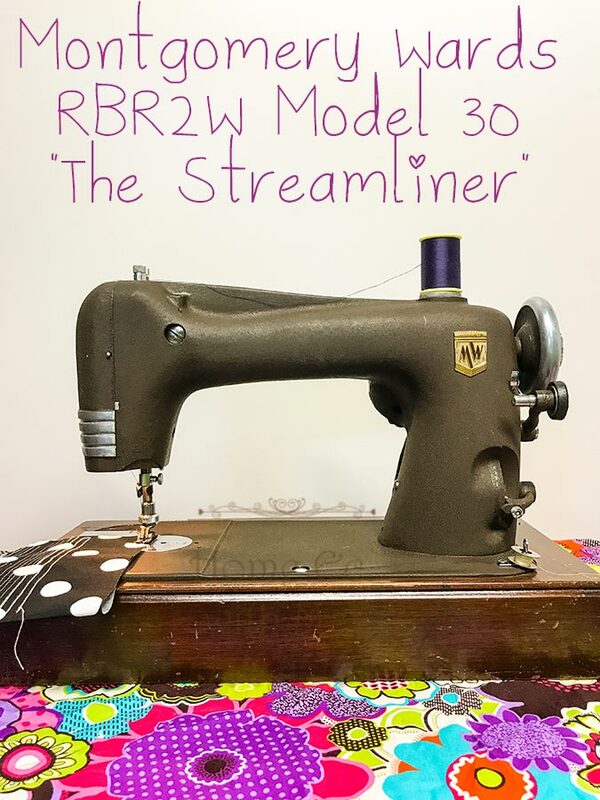 Hello everyone today I am going to highlight the Montgomery Wards RBR2W Model30, aka the Streamliner electric sewing machine. Like always we will be talking a little bit about the history involved with this sewing machine, some tips on cleaning and maintaining it as well as how to thread and operate the machine. With a bold nickname like The Streamliner, a person automatically expects the machine to make a visual statement and stand out in a crowd. Obviously, this machine does just that. It casts a silhouette unlike any other machine of its class and time period. 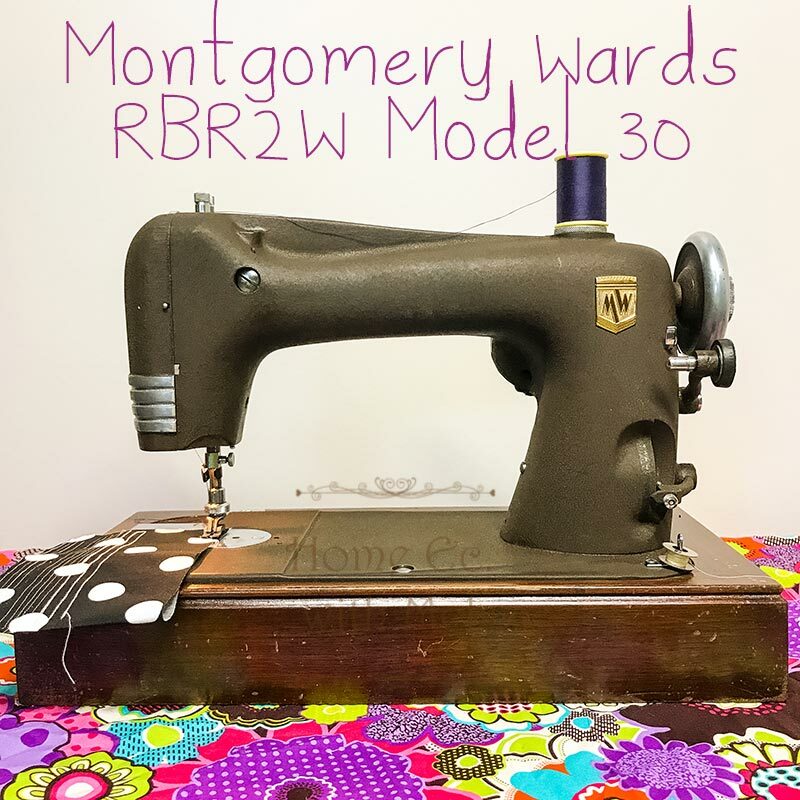 It was manufactured by the National Sewing Machine co specifically for Montgomery Wards as The Supreme Reversible Rotary RBR-2W model 30. Ironically it superseded the National Reversew model 40 which was a long bobbin shuttle machine with reverse sewing capabilities. The model 30 was granted a patent on Dec 31, 1940, and went into production in 1941 and with the exception of a few cosmetic changes, It remained unchanged as the flagship for Montgomery Ward until 1954 when the market crashed for the National Sewing machine co and they ceased production and closed the doors. One look at this beautifully designed machine explains how it got its nickname. Some will say it reminds them of a classic ocean liner cutting thru the fog coming into port, but for me, it is a classic locomotive pulling freight or passengers through the mountains and across the plains. Regardless of which scenario it reminds you of; in 1941 it reflected power and grace perfectly. It not only reflected power and grace it proved it with a smooth, quiet operation and it’s larger than average harp space. The Streamliner is a joy to sew with and easily switches from sewing heavy denim to finer lighter fabric with not much more than the expected needle change and sometimes an occasional tension adjustment to balance the stitch. When switching fabrics from one extreme to the other, regardless of the machine, needle size should always match thread and the thread should be matched to the fabric. That being said the Streamliner does a marvelous job. The biggest downfall to this scenario is the needle itself. The Streamliner uses a 20x1 needle that is not always instantly available in different sizes. The 20x1 needle is exactly the same needle as the common 15x1 needle with a longer shank. This means that the distance from the point of the needle to the eye is exactly identical. Therefore by sliding the 15x1 needle down in the needle clamp about 3/16th of an inch, it will work perfectly in the machine. The 15x1 needle is easily available and has an almost endless variety of special purpose needles. When threading the Streamliner it is good to remember that the only similarity between it and other machines is that it has a spool pin on the right and a needle on the lower left. Other than that unless you are familiar with other National Sewing Machine co sewing machines it will look like a confusing mess when compared to the majority of other brands of machines. The biggest difference is the lack of tension disks on a National sewing machine. It uses a small pulley and brake pad system to apply tension instead of two independent disks squeezing the thread as it is drawn between them. The pulley system works very smoothly and consistently regardless of the thickness or the fiber make-up of the thread. The thread is wrapped one complete loop around the pulley so when the thread is pulled it rotates the pulley on a shaft. The shaft is threaded on the end of a knob or cap and when the knob is tightened or threaded in, it puts pressure on a spring much like the more common tension disk systems but instead of applying pressure to the disk directly it instead applies pressure to a miniature brake pad which presses against the pulley to apply drag and in doing so it effectively increases the tension of the thread. Since we have just about covered the eccentric differences of this machine I will bring up the final two things which set this machine apart from the rest. The bobbin is typical of all the other National rotary sewing machines. The center hole in the bobbin is huge when compared to a class 15 or 66 singer bobbin, It measures close enough to 3/8th of an inch that when I got my first Grand rotary treadle machine I used a lathe to turn bobbins for it before I found an open market for replacement bobbins. The outer dimensions of the bobbin are slightly larger than a class 15 but the distance between the two sides is the same as a class 66 bobbin. The last and most predominant difference with the Streamliner may also be its Achilles heel. The motor housing is actually cast into the side of the machine. The rear bearing journal is milled into the body with the stator mounted to the actual body of the machine. The rotor is supported by the rear bearing and a front bearing cap held in place by two machine screws. The friction drive wheel is angled so as it wears it can be moved closer to the hand wheel and there are no other adjustments available. Truly a remarkable engineering undertaking that works superbly 99%of the time. But if the 1% happens and there is a motor failure there are no new parts to be had and the expense of taking the machine to a motor shop to be rebuilt has sent a lot of these machines to the scrapyard. When it comes to the operations of the sewing machine itself the Streamliner is very basic. It has a stitch length regulator mounted low on the pillar with a numbered scale adjacent to the point of the lever. When the lever is centered, the length is zero. As the lever is moved down, the stitches lengthen and the fabric moves away from the operator. When the lever is moved above the center the machine sews in reverse, moving the fabric towards the operator. The thumbscrew on the lever can be tightened once the desired stitch length is achieved. Once it is locked the operator can switch from forward to reverse and the length of the stitch will stay the same in both directions. The feed dogs do not drop but darning and free motion sewing can be accomplished by setting the length to the center and lightening the presser foot pressure. There are several attachments available to accommodate almost any specialized sewing technique an operator might want to use. The major downfall is the mounting of the feet and the attachments themselves. The Streamliner uses top mounted feet and finding the attachments designed for it is much more difficult than finding ones for high or low shank machines. I have intentionally skipped the threading and bobbin winding as well as the tension adjustments because there is a gentleman that has made the manual for this wonderful machine, FREE as a downloaded pdf. So if you are one of the lucky individuals that have this incredible machine you can follow the link to his page and either print yourself a full copy of the owner’s manual or download the file into your own digital library. Until next time, enjoy your machines your way. And may your worn out needles outweigh your broken ones.